So there I was, casually perusing the Flannel Friday pinterest board on “animals” looking for some new ideas, and I came across this post by Miss Tara. 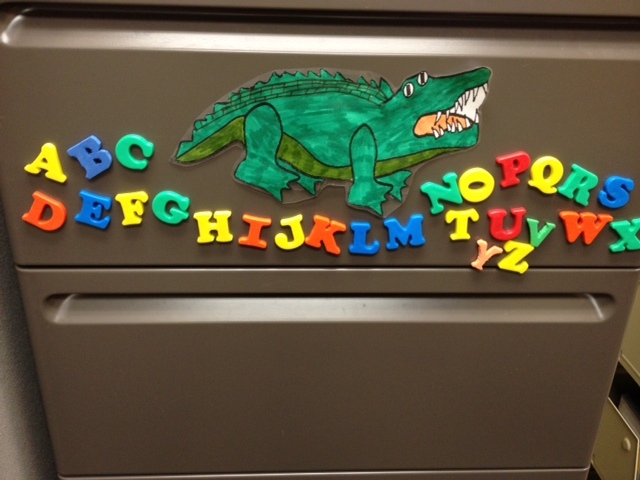 I was immediately inspired to make my own alphabet-eating alligator. I thought ever-so-briefly about cutting a hole in my alligator puppet’s mouth (NOT advised) and then started thinking of other ways to create my own alpha-gator. I thought about HOW LONG it would take me to cut out all of those letters and that I wanted to use my gator next week. What’s the solution? MAGNET LETTERS. I have some I got from the Target dollar section (can I get three cheers for the Target dollar section?) and haven’t been able to use them yet. My first attempt at a 3D gator was an unmitigated disaster. Two cardboard tubes covered in green felt, with one end cut to look like an alligator mouth, ended up looking like a snake with a weight problem who had been left in the dryer while wet. So I went 2D. The gator is laminated and has magnets stuck on the back. My plan is to stick him on a cookie sheet (I’ve ordered a magnet/white board from Lakeshore) and then, as he eats each letter, stick them on his tummy. I like that the kids will still be able to see the letters, as the shapes are referenced in the poem. There are a few too many letters so they’ll have to be piled up a bit. Now, this is still a work in progress because I’ve discovered that my letters don’t have very strong magnets. I’ve also ordered some of those via Lakeshore in hopes they’ll be better. If they aren’t, well, I’ll have to re-think this whole shebang. The Library Lady is hosting our round-up today. To see all past flannels, visit the pinterest page via the icon to the right.